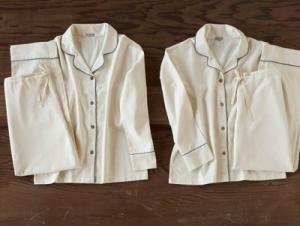 Organic Flannel Pajamas are a great natural solution for a cozy evening & morning - ok, even all day. Cozy organic flannel makes these the perfect winter pajamas. The collared shirt has shell buttons and one chest pocket while the full-length pants feature a drawstring waist. The natural color & design make it perfect for Men & Women. To prolong the life of your sleepwear and to minimize the environmental impact, we recommend machine washing all of our clothing and apparel at moderate to low temperatures on a gentle cycle and hanging to dry. Made in Canada with 100% SKAL Certified Organic Cotton. Click here to check out our other great pajama sets. These pajamas are made from 100% organic cotton, certified by SKAL. The pesticide- free cotton is hand picked, processed safely, and finished according to the highest environmental standards. Fabric is free of solvents and resins so that the natural softness of the organic fiber is all there is between you and a great night's sleep. • Availble Seasonally in Natural/Ivory Color shown.